Playing your favourite slots and table games on Bob Casino is half the fun, as Bob will keep you entertained with a variety of bonuses! 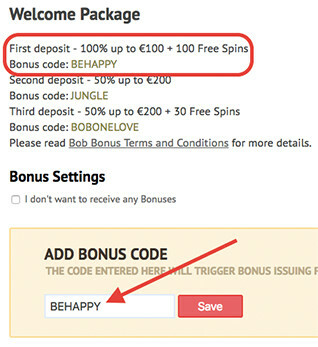 Bob's hospitality knows no limits and every new player can try out Bob Casino Welcome Bonus Package that includes bonuses for the first, second and third deposits and an overall bonus of up to €/$500 and 140 free spins! ✓The package is not available for the users from Hungary, Serbia and Croatia. Depending on the consecutive number of deposits you've previously made and considering your active bonuses, all new players can get the bonuses from the welcome package. Get a 100% bonus and up to €/$100, plus 100 free spins for the Book of Aztec slot! 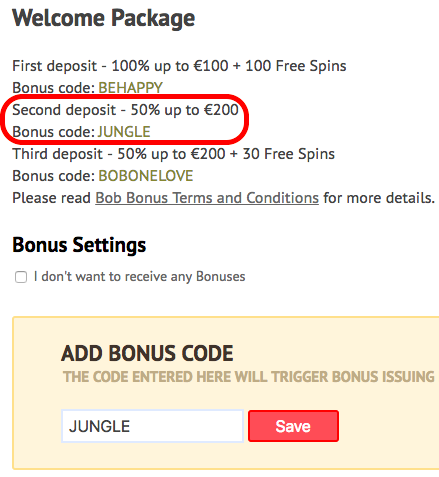 50% bonus up to €/$200 on your second deposit! Upon your third deposit, you can get 50% and up to €/$200, just like the previous one, with a sweet addition of 30 free spins for the Tipsy Tourist slot game! 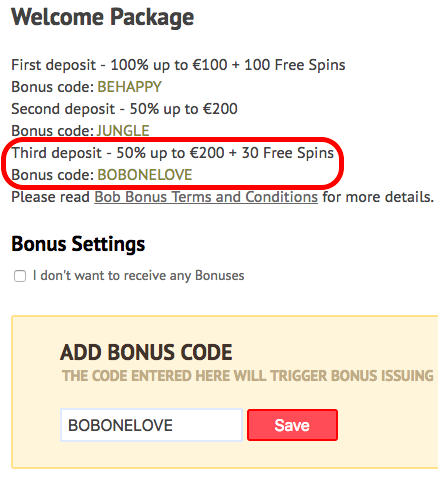 Simply enter the code BOBONELOVE before making the deposit. Making your First Deposit? Make sure to find out how to play with the First Deposit Bonus. You can only use one bonus at a time. Remember that all 100% bonuses and 50% bonuses are subject to x40 wager requirements, including the Second Deposit Bonus. Bob hopes that all of the bonuses will grant you a great game! In the meantime, we encourage you to read the Bonus Terms & Conditions to get a clearer picture on how the bonuses operate.